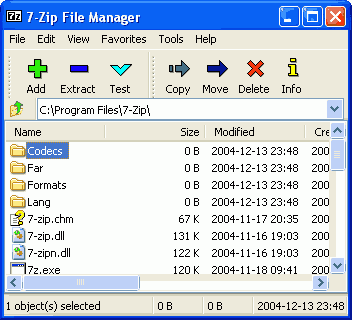 Description: It is the official file archiver for the open, high-compression 7Z format. This format achieves higher compression than many others via LZMA algorithms. In addition, it supports the creation/extraction of 7Z, ZIP, GZIP, BZIP2, TAR and XZ files, as well as the extraction of APM, ARJ, CAB, CHM, CPIO, DEB, DMG, FAT, HFS, ISO, LZH, LZMA, LZMA2, MBR, MSI, MSLZ, NSIS, NTFS, RAR, RPM, SFX, UDF, UPX, VHD, WIM, XAR, Z.